The theme is ALL ABOUT EVE: 56a. [1950 Bette Davis film hinting at something found 15 times in this puzzle]. The other three long Acrosses are EVEN STEVENS, EVEL KNIEVEL, and SEVEN ELEVEN (*grumble* The store is 7-Eleven, always with a numeral at the beginning). The stacked 9s in two corners provide SEA LEVELS, PET PEEVES, NEVER MIND, and PREVENTED, three out of four of which are lively. Those 11 EVEs are plenty, aren’t they? I’m not sure why there are four more (in SIEVE, ALEVE, EVENT, and EVERY). There’s nothing about the Bette Davis movie that mandates 15, is there? That overcrowding of thematic material, oof. A word like KEROGEN (37a. 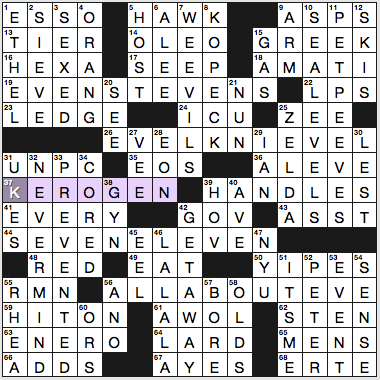 [Oil-producing matter in shale]) is really out of place in a Tuesday puzzle. With ESSO, ASPS, OLEO, AMATI, ZEE and VEE, EOS, KEROGEN, YIPES (who among us doesn’t fill in YIKES first? ), RMN, STEN, ENERO, ERTE, UKES, ORANG (which I never encounter outside of crosswords), ALEE … the Scowl-o-Meter broke one of its springs tonight and I’ll be up late repairing it. Either without the four short EVE-hiders or without the stacked 9s, this grid would have had a lot more capacity for smooth fill. All that fill (which didn’t slow me down, because I’ve been doing crosswords for so long, things like STEN and ERTE are gimmes … gimmes I rarely ever see outside of a crossword, and am glad to see in far fewer puzzles these days) bummed me out. 2.5 stars from me. The rEVEaler rationale is cute, but with no reason to include 15 EVEs, I wish there’d been fewer. 30A [Introduction from an Italian guy who doesn’t speak much English?] GIOVANNI IS I – This I thought was “John here” in Italian, but I think the intended reading is listed. 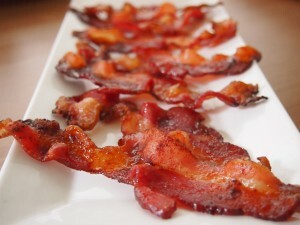 These puzzles make me hungry! The theme entries are all phrases missing the letters “RIB,” so there was TRIBAL TATTOO, the actor GIOVANNI RIBISI, and DISTRIBUTOR CAP. I must say, it is fun solving a puzzle and not getting the theme right away, and then having a nice “a-ha!” moment near the end. I suppose the title could have clued me into what was going on, but I am also kinda trying to solve for time, with the tournament only about a month away, so I am focusing more on filling quickly than theme ideas. At the tournament, this is, at least for me, the key to that gnarly puzzle #5! The quicker you get the theme, the easier your solving goes! 55A [It’s often served sweetened] GREEN TEA – Probably because this is not too tasty UNsweetened! 8D [Yeezy Boost 350, for one] SHOE – This is funny! I believe this is one of Kanye West’s shoe designs. Better buy a pair; he’s practically broke!! 10D [Where Chad is] IN AFRICA – … it sure is! 13D [“Only ___” (Oingo Boingo song)] A LAD – I have NEVER heard this song before. Maybe a bit obscure … ? 29D [Lena Dunham show] GIRLS – This I HAVE heard of. Funny show! 66D [Late actor Vigoda (for real)] ABE – This is also funny, even though it is finally true! Kudos for a nice sense of humor in this puzzle! Until next week! 23A [GEICO spokes critter who squeals, “Wee wee wee!”] MAXWELL – Spokescritter! In actuality, I don’t think I knew what his name was … ! 3D [“Silent Night” words before calm and bright] ALL IS – Great clue. Made me think a second. 30D [“Dies ___”: Latin hymn] IRAE – I don’t think I have ever heard this. Only know this from puzzles! 50D [Online investment service] E-TRADE – I had an E*Trade membership many moons ago. Do people still use this service? Until this weekend’s tough puzzles! Have a great week! 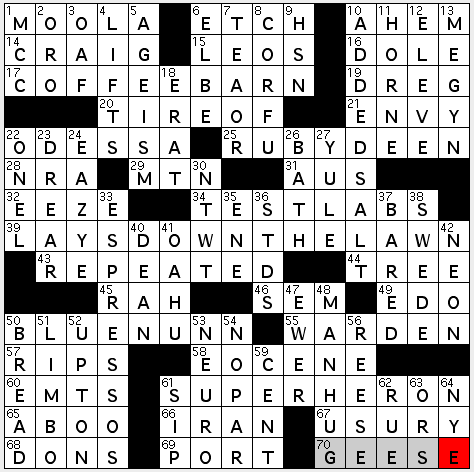 Well, I won’t vouch for exactly how “easy” this puzzle was (in my experience, the SE managed to put up some resistance), but oh, boy, was it “nice.” Seriously nice, in fact. This is an “add-a-letter” theme and Liz has done it to a turn. With unlikely-sounding clues geared to their literal results, five well-known base-phrases and -names become the beneficiaries of an additional final “N” (see title…), creating new and smile-inducing themers. 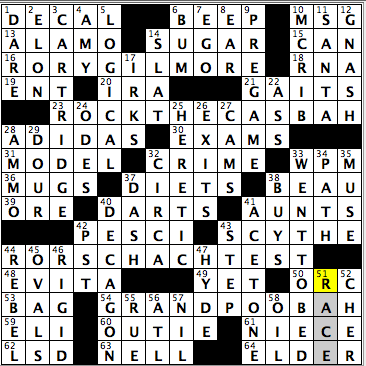 Further, there’s a lot of interconnectivity between answers within the grid—my positive take on the idea of “crossword glue”—which makes for a puzz with a lotta integrity (like the crossing of the Spanish [Dinero] for MOOLA and the Spanish reference of [Grenada’s gold] for ORO). It’s solid. It all hangs together. So, let’s check it out. 17A. [Stable environment for a Starbucks store?] COFFEE BARN. And we’re off. You see how this works, yes? Base phrase: coffee bar. Starbucks sells COFFEE, horses can be stabled in a BARN, whence comes COFFEE BARN. Apropos of the beverage in question, we also get a sophisticated option with ESPRESSOS. Notice, too, how the beverage-associated [“Coffee, TEA OR Me?”] crosses the themer at the “A.” People of a certain age should know that title, btw; if it doesn’t ring a bell, this link’s for you. 25A. [Gemstone developed by an “American Gangster” actress and Chef Paula] RUBY DEEN. Wow. Funny idea, but talk about something that’s never gonna happen for sooooo may reasons. ;-) So funny, incongruous idea, too. Seems appropriate, though, that the foodie-fill ADDED SALT [Used a tabletop shaker, say] should cross the professional foodie (who seems to love her seasoned SALT…). 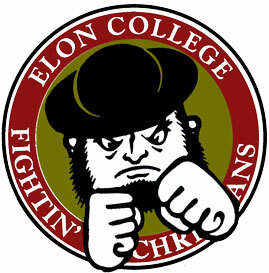 And look: the puzzle also includes Chef DEEN’s homophone, the college DEAN [Campus bigwig]. 39A. [Sods?] LAYS DOWN THE LAWN. 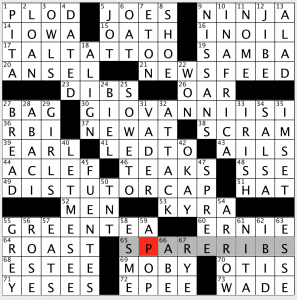 This grid-spanner is just gorgeous, and I’m gonna bet it was the, uh, seed-entry for the puzzle as a whole. 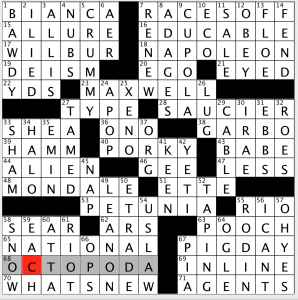 Love that terse clue, too. 50A. [German wine named for bawdy ex-Senator Sam?]. BLUE NUNN. Am glad that Liz went with “bawdy” rather than “sad” in the clue. Keeps things lively. Also loved being reminded of the BLUE NUN brand, which made me think of the Stiller and Meara radio spots for it. New territory? Try this one on for size. Want some [Sweet wine] instead? Try the PORT. Wine not your thing? [Try the sherry] SIP. (Btw, here’s a little piece on the difference between PORT and sherry.) And on the subject of religious orders (back to that Blue Nun now), brava for the amusing yet potentially ambiguous [Sch. for a father-to-be] SEM(inary) combo. Ohhhh. That kind of “father-to-be”! 61A. [Big bird in a Marvel squad?] SUPER HERON. Again, a strong, funny concept at work here. Truth is, the grey heron and the great blue heron are the largest of the species in Europe and North America respectively. From the looks of things, however, you don’t wanna be on the wrong side of a grey heron! Liz may be on to something here. Wolverine, Iron Man, et al., better watch their backs! Back to the title and interconnectivity. It was Frank Sinatra who probably made the definitive recording of “Nice ‘n’ Easy” (music by Lew Spence, lyrics by Marilyn and Alan Bergman). Neither Sinatra nor this American Songbook classic could be farther away from rap if they tried. But look who’s sharing grid real-estate: EAZY-E [Stage name of rapper Eric Wright]. Finally, gotta love a puzzle that gives us MAN HUG [Modern greeting between guys]. 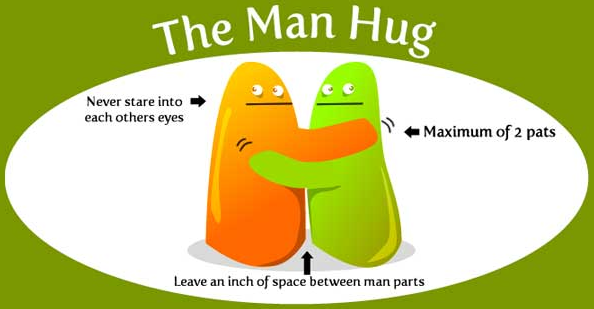 Full disclosure: while I’ve seen MAN HUGs, I don’t remember hearing the term—or knowing there even was a term (since apparently I do live under a rock…)—and it just made me laugh. 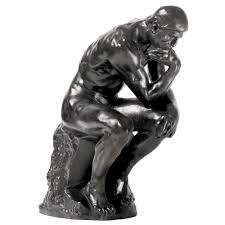 Which is something I like to do. And on that note, folks: I leave you for today. Keep solving and come back again next week! Happy March! I guess that explains why we have a puzzle entitled “Brass Bands”. Who’s ready for a parade? Richard Mausser brings us today’s puzzle in which brass instruments are combined (or “banded”) with other words to make new, wacky portmanteaus. The endings of the instrument share the same letters as the starts to the other words. I like the idea on this one—blending two words for wacky effect, but this doesn’t quite work for me. 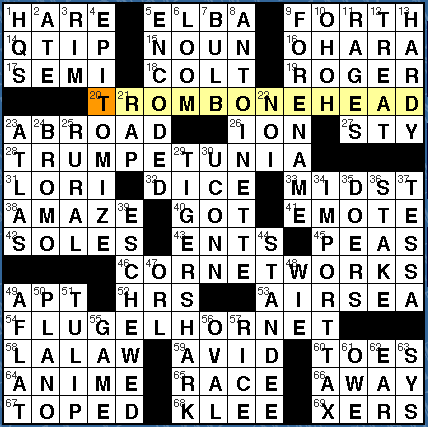 I like TROMBONEHEAD because you can imagine someone who is a trombone fanatic. And maybe you can imagine a PETUNIA made out of brass, but the rest? What is a brass broadcaster? I suppose a broadcaster that airs brass bands 24/7? Don’t know. And a FLUGELHORNET? I’m not getting surface sense from that. TROMBONEHEAD is different than the others in that the second word, BONEHEAD, is a compound word. I would’ve have liked it better if the rest of the themers worked in a similar way. For example, TRUMPET PEEVE, CORNET FLIX, FLUGELHORN BILL, or similar. Away from the theme we have some nice long answers highlighted by ANTOINETTE, TIGER SHARK, and IMPORT TAX. Great stuff! We also get longies EPITOMIZE, FORENAME, ESCHEWED, ENCODED, and STANDEE. That’s a lot of long non-theme fill and most of it is at least good if not strong. 8d ANTOINETTE [Perry who’s commemorated with a theater award]. She died in 1946. 24d BROMO, which is a [Stomach soother, for short]. The Urban Dictionary definition of BROMO is quite different. Why ORL is crossing HRS when they should be OIL and HIS. Is there a dupe I’m missing? Nice grid with very good non-theme fill. The theme idea is solid, but I feel the desire to make the theme clues consistent takes away from the effectiveness of the theme entries. Good morning, everybody, and welcome to March! Today’s crossword puzzle, brought to us by Mr. Jeffrey Harris, has an interesting theme, as the four theme answers actually act as pairs to pull off the trick. Theme answers No. 1 and No. 3 begin with a word that has a “roar” syllable to start out, while theme answers No. 2 and No. 4 end with “bah” syllable. Very interesting concept. RORY GILMORE (16A: [Daughter of Lorelai, on a 2000s TV show]) – Any Gilmore Girls fans out here?. Most fun in solving the grid was, finally, figuring out what the theme was, as I was surveying the completed grid for a couple of minutes to make sure I totally understood what the theme was. This grid was perfect for a family reunion, with both AUNTS (41A: [Some family reunion attendees]) and NIECE in the grid (61A: [Certain family reunion attendee]). And maybe during that reunion, the niece brought her new BEAU to show off to the family (38A: [One of the Bridges brothers]). Well, Spring Training starts today, so get ready for PREGAME shows dedicated to the National Pastime to hit your airwaves very shortly (9D: [Before kickoff]). Let’s just change “kickoff” to “opening pitch.” On the pregame note, I remember when I first was in college, and first heard the word “pregame” in reference to drinking at your place before going out to party. I absolutely was the naïve one and thought to myself, when I heard my friends talk about pregaming, that we weren’t attending a sporting event tonight. Took me a couple of times before I knew what that meant. With that said, I was far from the “pregamer” in college. See you at the top of the hump for Wednesday’s grid! This entry was posted in Daily Puzzles and tagged Elizabeth C. Gorski, Freddie Cheng, Jeffrey Harris, Jeffrey Wechsler, Matt Jones, Richard F. Mausser. Bookmark the permalink. The WSJ brass-banding really tickled me, especially the FLUGELHORNET. Flights of fancy are naturally resistant to common sense interpretation! Loved the WSJ today. I looked forward to getting the next musical instrument and I can imagine a somewhat-more-musical-than-usual hornet. CORNETWORK was a little blah – Netflix would have been more fun – but all in all, a fine puzzle with good long non-theme answers. (wsj) I loved it too. Clever and amusing. So I wonder where the horrible votes are coming from. What a great LAT puzzle!